Safe transactions and the protection of your privacy have always been our top priorities. Far East Flora Pte Ltd uses SSL encryption together with a digital ID from GeoTrust. SSL encrypts and protects personal and credit card information that you send us. Information such as your credit card numbers, names, addresses and phone numbers that you send us are safe from the prying eyes of unauthorized third parties as it travels through the Internet. The digital ID guarantees that your transactions are taking place on our secure server and not a third-party host. 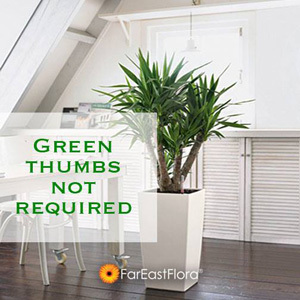 The goal of Far East Flora Pte Ltd is to constantly provide quality products and excellent customer service. As such, we gather personal information (in the registration form) so as to allow us to know you better. With this information, we can then understand you better and provide a more enhanced and personalised shopping experience for you on our Internet store. All data is collected by lawful and fair means and with the knowledge and consent of customers. Data is gathered solely through customers' voluntary input online or over the phone or filling in of forms at the shop front. Far East Flora Pte Ltd assures users that confidentiality of customers' data is maintained and protected. Personal information is kept solely for sales transactions, internal marketing and billing purposes only. Customers' consent will be sought if information is to be used for purposes other than completing sales transactions, internal marketing & billing, either by Far East Flora Pte Ltd or any Third Party working with us in any business collaborations. In all, we would like to stress that information is not sold to or shared with other parties for any commercial purposes other than normal order fulfilment and confidential site activity or sales tracking. At Far East Flora Pte Ltd, we do not disclose any of our customers email addresses or information to other parties without prior consent of our customers. At Far East Flora Pte Ltd, the customers' particulars are solely for the purposes of completing sales transactions. We are committed to maintain and protect the confidentiality of customers' personal data. Customers' particulars are for the purposes of completing sales transactions, internal marketing and billing. The customers' particulars will be retained for the convenience of customers' future transactions. Should you need us to remove your information, please contact us at (65) 6472 5365. Without obtaining our customers' consent, Far East Flora Pte Ltd, will not tamper with customers' browsers or computers. We also endeavour to keep up-to-date policies and procedures to protect personal data. Login to your account, go to the Newsletter Subscription page and uncheck the "General Subscription" to unsubscribe. For non-account: Using the email which you subscribed, send a message to custsvc@fareastfloragarden.com with the word 'unsubscribe' in the body.